Just married: One of the thousands of Chinese couples who exchange vows in Santorini, gets artistic. Forget about the bottlenecks in Fira, the multitudes of sunset seekers in Oia, the hunt for a table with a view, the signs that read “do not enter – private property,” the inevitable dissonance resulting from the arrival of 2 million visitors on an island that is disproportionately small relative to its global fame. Try to escape, if only for a bit, from the magnetic pull of the caldera. Put on your most comfortable walking shoes and chart your own course. An afternoon, for instance, can be spent in Vothonas, a settlement excavated into the banks of a ravine formed by a torrent. The bed of the now-dry Potamos serves as the main street, with lovely gardens on either side, “for in this sheltered spot everything flourishes,” as the English explorer James Theodore Bent wrote when he visited the island in 1883. Have a wander around and take in the architecture, before finding the gravel path that leads to the Church of Panagia Trypa, or Panagia Sergena, hewn into the volcanic rock centuries ago and used as a refuge during the Turkish occupation. The church celebrates on February 2 each year with a big, open fete that is one of the major events on the island’s calendar. Spend a day exploring the highest village (and former capital), Pyrgos, with its 15th-century Venetian castle. Enjoy a coffee at Voula’s Kantouni in the shaded square. Stop off for a tour of the “Santorini of the Past” exhibition housed in a 19th-century building next to the famed Selene restaurant, for a glimpse at the rural and traditional way of life long before the island became a world-class travel destination. Afterwards, ascend through the narrow streets to the upper square, where the main gateway to the castle once stood. Invaders were greeted with boiling oil poured from a square bastion known as the Fonissa (“Murderess”). Higher up, at 567 m., the Monastery of Profitis Ilias affords a magnificent view and one of the most beautiful sunsets on the island. The quiet side: Finikia settlement stands out for its architecture. 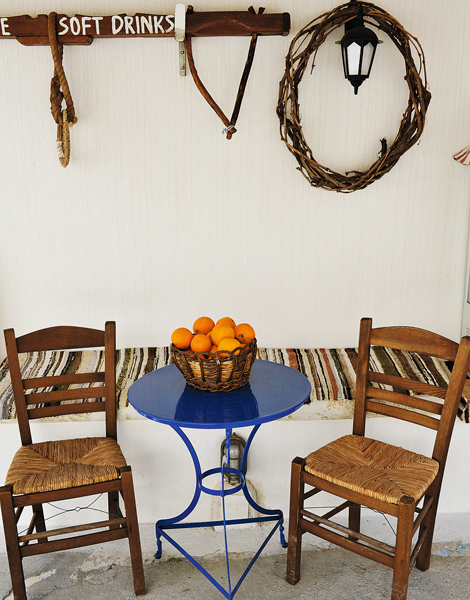 Catch your breath: An old barber shop in Emborio village, turned into a traditional kafenio. If you’re not put off by all these steep climbs, we have a few more to suggest. 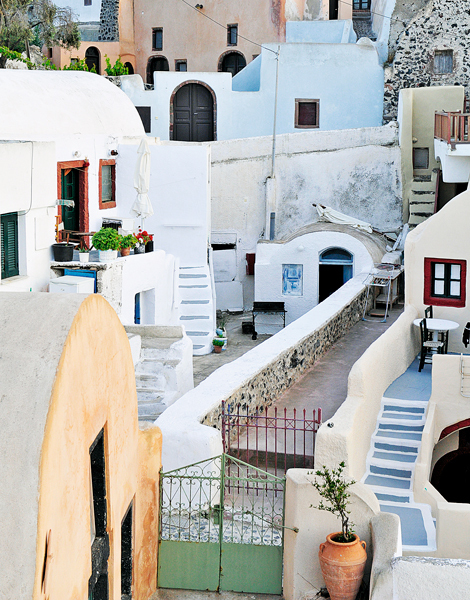 Emborio, the largest village on Santorini and its old commercial hub, boasts its own medieval castle, the best preserved of the five on the island, but also a number of churches and old windmills. Again, a labyrinth of narrow alleys awaits exploration. Another climb that is well worth the effort is at Mesa Vouno, up to Ancient Thera, where the wind, the view and the energy emanating from the ruins can clear the mind of even the most persistent everyday worries. It’s a simple truth that to really get to know Santorini you have to walk it. 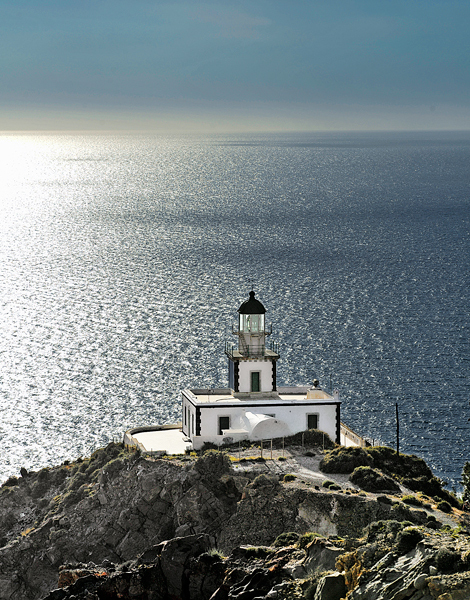 The view from the Fira-Oia path (3 hours at a normal pace) is out of this world; the old path from Megalochori to Loutra Plakas soon brings you to a spot favored by geologists for studying the morphology of the caldera; the walk from Akrotiri to Faros (lighthouse) will reward you for your efforts as the sun goes down and also reveal the “Indian” rock, so called because of its likeness to the face of a Native American. Don’t be afraid to discover places off the beaten tourist path. And don’t forget to chat with the locals. The elderly in particular will share memories from the time before and right after the earthquake, when the island was poor and neglected, sending its children to seek their fortunes elsewhere. They will help you understand the turn to tourism and how, in the first few decades, it was out of control, as vineyards and vegetable gardens were turned into rooms-to-let and other facilities catering to tourists. And then there was light: The “Faros” in Akrotiri, built in 1892 by the French Lighthouse Company and fully automated since 1988. 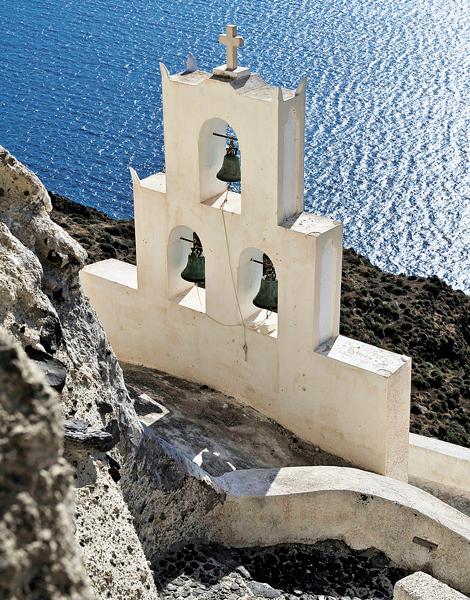 Famous bells: Chapel of Saint Nicholas, above Plaka in Megalochori, right on the edge of the caldera. The young people, most of them well educated and well traveled, dearly love the island, even if they do not hail from it; they will speak about the need for a change of direction, one that focuses not on visitor numbers but on what those visitors gain and how they advertise Santorini when they are back home. Quality, authenticity, a human scale and an extension of the season into the winter months are the issues that matter to an island that is trying to reconnect with its soul.